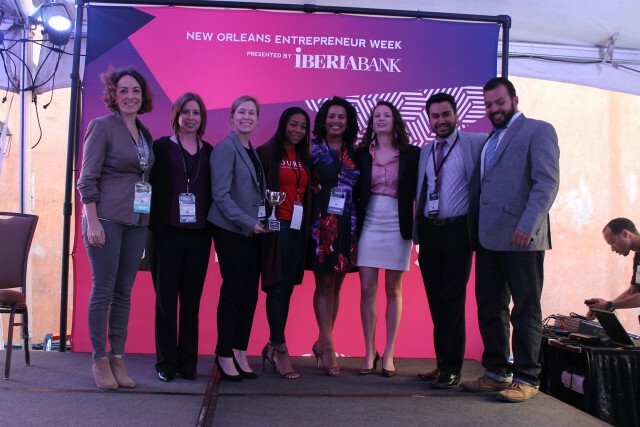 Last Thursday, Loyola University New Orleans, in partnership with The Idea Village, launched the immersive IDEAcorps Consulting Competition as part of New Orleans Entrepreneur Week, presented by IBERIABANK. The intensive 34-hour challenge was an exclusive MBA student experience, through which teams of students helped founders of New Orleans-based, technology-driven startups to advance their companies in four days from March 10-13, 2016. Local startup TOURED and Loyola University won the competition. Loyola University and The Idea Village brought together three MBA teams from Loyola, Louisiana State University, and Tulane University for the IDEAcorps competition, based at the small business incubator and co-working space Landing Zone in the Lower Garden District. Each team worked with a founding entrepreneur to identify a problem his or her company was facing, validate a solution, and create a plan the entrepreneur could implement immediately. Teams also had the exclusive opportunity to attend a dinner with members from Entrepreneurs’ Organization Louisiana on Saturday night. TOURED (founded by Karynn Verrett) is a modern, travel-guide app designed to make traveling easier for everyday people by curating highly personalized travel experiences on the go. In a close call and after a period of deliberation, the judges’ panel awarded the prize to the Loyola University MBA team for having brought their startup, TOURED, the farthest during the four-day challenge. The judges also recognized the hard work and dedication shown by the Tulane and LSU teams with their respective startups, Gradsquare and ECHO. This year, the IDEAcorps consulting challenge will be hosted for the first time by Loyola University New Orleans, where the College of Business has a new and invigorated focus on entrepreneurship and newly established Center for Entrepreneurship and Community Development (CECD). In this way, the challenge will help to spotlight and boost entrepreneurship and local start-ups based in New Orleans.